Ready to knit? If you don’t know how, Knitorama will teach you. One of the best things about this book is its ability to teach you how to knit, the different techniques you can use, and a number of different photos that will show you what you should be doing. Unlike a lot of books out there, it could actually teach anyone how to knit and love doing it. It even explains problems many knitters may experience; even pro knitters will learn something. The number of images used are so cute - some of them just too funny, too, like the poses struck by some of the people modeling finished knitted pieces. 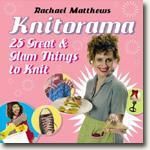 Even Rachael Matthews looks funny, with her wild hair and crazy knit clothing. Witty comments surrounding the images makes the book more pleasurable. A lot of the items created in the book are useful - a washing hand for car washes, nice lingerie that looks cozy to sleep in, and blindfolds. Each item usually comes with an image or two, and the book clearly explains how to complete each project. It is nice to see a knitting book filled with some very practical items to create. If you lean more toward whimsy with your creations, you may enjoy all the fun things that are also shown to knit. Rachael knits chocolate cakes, beer, tarts and all sorts of things that look good enough to eat. I can’t imagine going out in egg earmuffs, but I am sure some people would like it. This clever, creative book is a keeper even for those who have knitted for years and years. Rachael makes it fun to learn how to knit and gives you plenty of ideas for knitting your own lovely creations. No more learning how to knit the old-fashioned quilts and sweaters! This book gets four and a half stars for good old creative fun.